Your home has a “walk score”…curious what it is? I gave it a test drive for my house and it seemed about right. The site is getting a lot of web traffic as many home-buyers are using it to find “walkable” neighborhoods. To find out a home’s (or your own) walk score, you can go to the walkscore website here. For home buyers looking to buy a home in a “walkable” neighborhood in Raleigh, most of the older walkable neighborhoods will be found Inside the Beltline or near the North Hills Area. 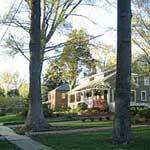 In recent years, several new neighborhoods have been constructed to create a walkable feel as well. Brier Creek, The Heritage in Wake Forest, Bedford at Falls River are some of the most notable. When the National Association of Realtors did the buyer survey for 2010, one of the highest ranking influences in a buying decision was “convenience”. While Raleigh is considered a mid-sized city, it continues to gain national attention because of the “big city” amenities. With great schools, shopping and entertainment in Raleigh, many home-buyers focus their neighborhood search efforts on being located around these amenities.